Shoppers including furloughed federal workers visited the Catholic Community Services food bank on Wednesday. Carrying a half sheet of paper in her cart, indicating she’s a federal employee, Meyers weaved past shelves of cereal and green beans, and pallets of milk jugs and apples, surveying how the choices in front of her fit into her diet. “I am gluten-free, dairy-free, and try to be sugar-free, so it’s kinda hard right now,” Meyers, who has worked at the local IRS office in Ogden for the past 19 years said. But as the federal shutdown stretches into a third week, an especially big impact is being felt in this Utah city, where thousands of federal employees live and work. Now the food bank has opened to help furloughed workers who, come Friday or Monday, will miss their first paycheck. 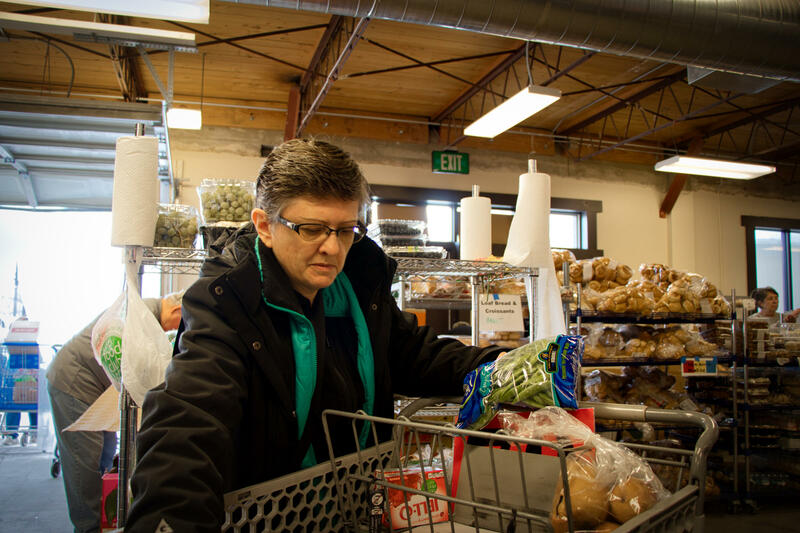 Usually, the Catholic Community Services pantry helps families whose income is below 150 percent of the federal poverty level — about $38,000 for a family of four. With the shutdown, they’ve opened the facility to any federal employees with an ID badge or a past pay stub. Maresha Bosgieter, director of Catholic Community Services of Northern Utah. There are around 5,000 employees in the Ogden area who work at the local IRS offices. The small Wasatch Front city is also home to workers at local Forest Service offices and Hill Air Force Base. 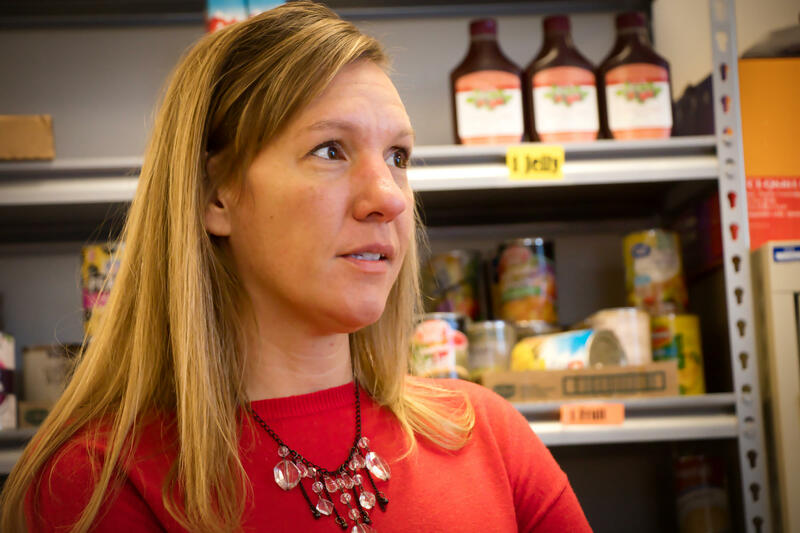 The food bank has been serving about 50 percent more families this week than they usually do, according to Maresha Bosgieter, the director of Catholic Community Services of Northern Utah. “They’re definitely struggling not knowing when their next paycheck is gonna happen. They’ve got bills to pay right now and gas to put in the car and kids to feed and everything else going on. So, no questions asked, they’re just able to come in and get a cart of food,” Bosgieter said. Negotiations again broke down between congressional Democratic leaders and the White House on Wednesday, so for now, the need for food could grow. Meyers describes the federal shutdown in one word: fear. Cheryl Meyers works with the Ogden IRS office. She visited the Catholic Community Services food bank on Wednesday. The stress of the government shutdown on her finances has caused Meyers to have anxiety attacks and, she says, she was even suicidal this week. She also had to cancel several doctors visits because of the cost of copays. Questions remain about who will — and who won’t — be paid on Friday. The food pantry is a small relief when it comes to bills. Normally Roger Sibley would be paid Friday by the federal government, as he has for the past 16 years as an IRS employee in Ogden. The pantry offered a temporary bridge. Utah is keeping its national parks open during the government shutdown, but hundreds of other federal workers employed in the state are facing a more uncertain future. If the impasse over President Trump’s proposed border wall makes it to Saturday morning, this will be the longest government shutdown in U.S. history. And it has an unlikely victim — craft beer.